Steelers Coach Mike Tomlin Is 1 Of Only 3 Black NFL Head Coaches & He's HOT About It! It's worse than Trump and Pence's "look at our diverse group of whie and white-ish priviledged interns" pics. In the picture above, you only see TWO black head coaches, but there's actually three. Pittsburgh Steelers head coach Mike Tomlin (along with five other coaches who are not black) were not present for the photo-op, but it still represents an accurate representation of who's making the plays for the professional football teams. Out of 32 NFL teams, there are only three African-American head coaches, which include Tomlin, Los Angeles Chargers head coach Anthony Lynn, and newly hired Miami Dolphins coach Brian Flores. 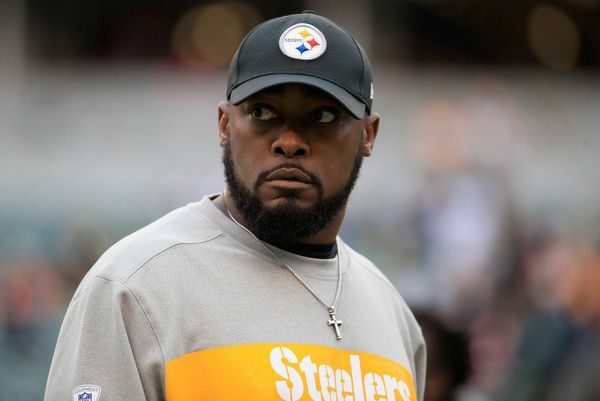 Tomlin - who's entering his 13th season with the Steelers - opened up to Gerry Dulac of the Pittsburgh Post-Gazette about how disheartening it is to not see his peers in the same circle. The NFL has the "Rooney Rule" in place (adopted in 2003), which requires teams to interview minority candidates for each head coach opening. It was named after former Steelers owner Dan Rooney, who hired Tomlin for the job. However, Rooney passed away two years ago, and since then, diversity has dwindled. Over the last 15 coaches hired by NFL teams, only two of them are black, but Tomlin isn't giving up hope. Even after most of the head coaches axed this past year are black. In a four-year period beginning in 2014, six of the 27 new head-coaching hires in the league were black. Only two of the 15 hired the past two years are black, including just one of the eight this season (Flores). What’s more, five of the eight minority head coaches — Wilks, Marvin Lewis, Hue Jackson, Vance Joseph and Todd Bowles — were fired either during the 2018 season or shortly afterward. Wow. So the NFL doesn't mind black people running up and down the field with a ball, but they're not going to put them in position to call the shots. Got it. We're sure black QB's have similar thoughts. Even Cam Newton just spoke on the unique obstacles of black QB's after that tragic interview years ago where he said he's not treated any differently.